With nearly 1,180 cubic miles of water, Lake Michigan is the second-largest in volume of the five Great Lakes. 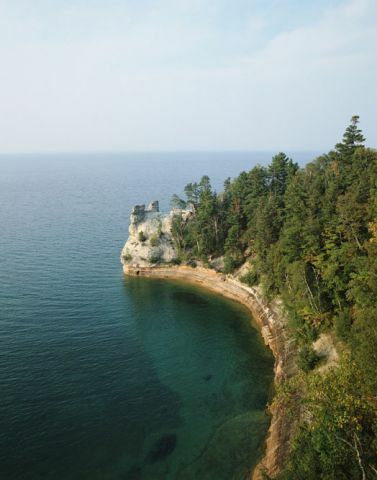 It is also the only Great Lake entirely in the Unites States; all others share shorelines with Canada. Four states touch the lake: Michigan on the north and east; Indiana and Illinois to the south; and Wisconsin to the west. The "lake effect" produced by cold winds sweeping down over its waters during winter creates heavy snows on its eastern shores. At approximately 307 miles long and 118 miles wide, it boasts over 1,600 miles of shoreline. Major metropolitan centers along those shores include Milwaukee and Chicago. The Lake Michigan region is a popular vacation destination for Midwesterners, with local draws ranging from the exciting nightlife of Chicago to serene countryside filled with cherry orchards and rustic campgrounds. • Michigan - Find travel information, maps, tourist resources, and more photos of Michigan. • Lake Michigan - Features Lake Michigan maps plus environmental and tourism information.